Cleaning a down comforter is not like doing regular laundry. There are special steps for washing your comforter that will allow you to clean it properly and greatly extend the life of the down bedding. 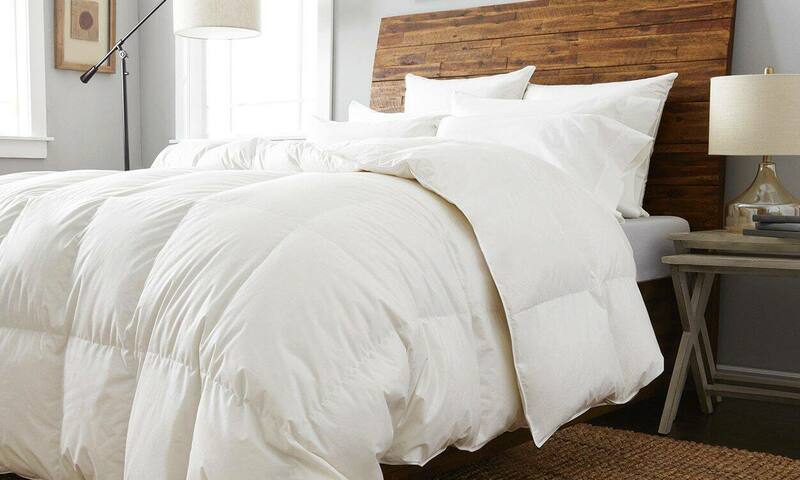 Here's how to wash a down comforter to keep it clean and comfortable for years to come. Check your comforter’s tags and instructions for information about the material and washing requirements. Follow any guidelines about washing machine settings, detergents to avoid, and whether it should only be dry cleaned or professionally cleaned. Depending on the size of your comforter and your washer and dryer, you may need to take it to a laundromat to be washed in an extra-large washing machine. Keeping in mind the guidelines from the comforter’s tags, you should spot clean your comforter with a pre-treatment stain remover. Let the treatment soak for a few minutes to a few hours, depending on the stain. Set your washer to a delicate setting and use a gentle detergent without bleach. Also, use the extra rinse cycle if the washing machine has one to ensure all the detergent is rinsed away. Place a rubber dryer ball or a washable shoe with your comforter to keep the down filling from bunching up. Mildew can grow in damp bedding and ruin it, so it’s important to thoroughly dry your comforter. Set the dryer on its lowest heat setting and remove the comforter periodically to make sure it doesn’t burn. Use the rubber dryer-ball during drying as well to break up the down inside the comforter. After drying, let the comforter sit out for a few hours to ensure there are no damp spots left before putting a duvet cover over it.